This is our first iris (from above) that bloomed last weekend. It was gone by Monday, but another bloom on the same plant opened later in the week. This is a fairly young plant though, and it’s in a new bed that was just planted last year. That’s one thing about irises. They are slow growers, but they are very hardy. In the seven years we’ve lived in our house, I’ve only split irises once. And those were the ones we planted the first spring we were in the house. And some of those new bunches I planted have never matured to the same size as the original bunch. And some have never even bloomed. If you are thinking of planting irises, I suggest buying a mature plant from a gardening store or nursery. And don’t just buy one. Buy three and plant them very close together. 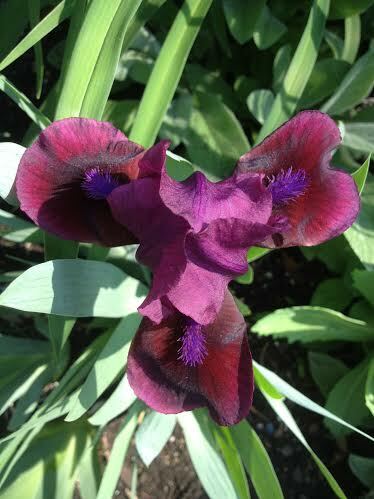 Or plant them close to other irises if you already have some. They do much better, and grow faster, when they are in larger groupings. Tomorrow, I’m posting a picture of our second bloom which opened just a few days ago.